The Kingdom of Axum, in modern-day Ethiopia, existed from 100AD to around 970Ad. It was among one of the prosperous kingdoms until it was laid to waste by a queen driven by anger and vengeance. Queen Gudit or Yudit is said to have invaded the kingdom from the south and not only destroyed the city but also its countryside including the churches and monasteries but also usurped the king and ruled for 40 years. The origins of Gudit is not exactly documented and there are quite a number of theories about her. In one story, it is said she was once the queen of Damot, a kingdom located close to the Blue Nile. The story also states that she was related to the Sidama people of Ethiopia. Another story claims Gudit was a Jewish woman of the Agaw tribe. It claims she was either a Beta Jew (Ethiopian Jew) from the get-go or was converted to Judaism by her husband Zenobis. She has also been linked to the Sultanate of Showa, also in Ethiopia, but as the daughter of King Maya named Badit. The Somali believe she was one of the Harla people, called Arawelo. As a young girl growing up in a non-christian family, she suffered marginalisation for failing to convert to Christianity. Apparently, she fell in love with a young deacon who was in charge of the Ark of God in the Church of Zion. She requested him to bring her as a gift of his love the cover of the replica of the Tablets of Law called Tabot. Once she received it, she made shoes and pranced about town in them, thus committing blasphemy against the church and the Holy artefact. As punishment, she was captured, had her breast cut off and sold into slavery in the Middle East. The story says that Zenobis, the son of the king of Sam (Syria) fell in love with her and married her. She kept convincing him to attack Axum but he declined because he knew the strength of the Axum army. Fortunately, thanks to her spies, once she found out that King Degnajan was away, she planned her attack. Gudit came back to Axum with a revenge mission. 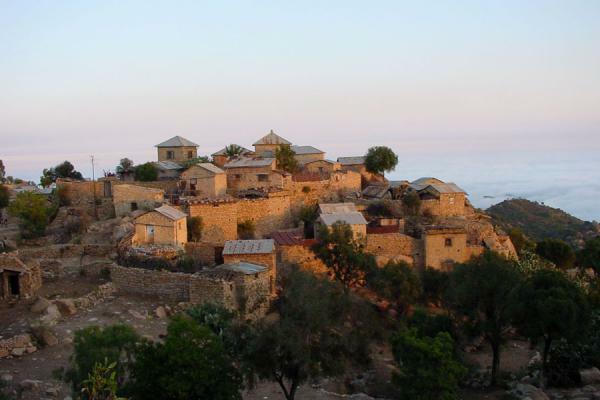 She hid in the monastery of Debre Bizen in Eritrea. Until today no woman is allowed to visit. With her husband as the head of the army, she attacked Axum. It has been said that her attack was so swift and efficient, that the kingdom’s forces were unable to keep up. King Degnajan sent a letter to Philotheus, the Patriarch of Alexandria, Egypt to ask for help but to no avail. On my first visit to the rock church of Abreha and Atsbeha in eastern Tigray in 1970, I noticed that its intricately carved ceiling was blackened by soot. The priest explained it as the work of Gudit, who had piled the church full of hay and set it ablaze nine centuries before. Gudit went on to rule for four decades. 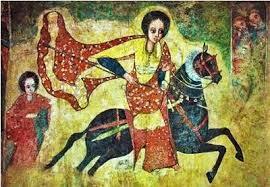 She is considered one of Ethiopia’s fiercest warriors and strategist. Her name Gudit in Amharic is Esato, which means fire. She was succeeded by the son of King Degnajan.